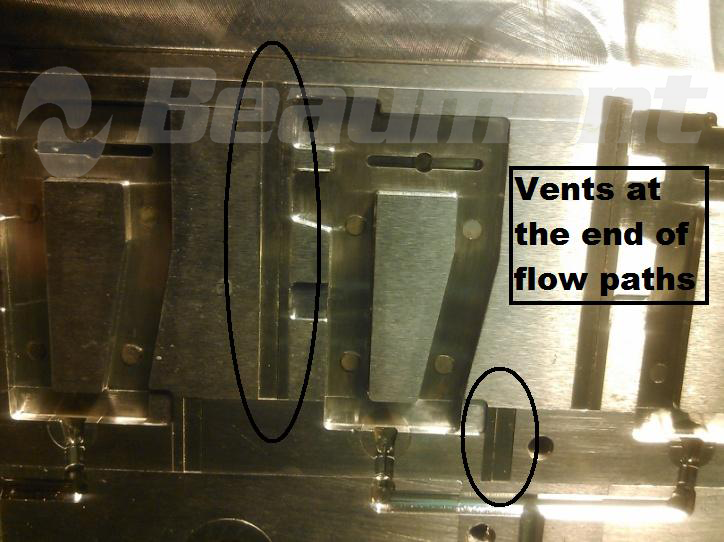 Vents - Beaumont Technologies, Inc.
Vents are cuts within the mold steel that allows air to escape. Air inside of the mold must be allowed to escape so that the plastic can fill the entire space. Without vents, the trapped air will compress as the plastic tries to force the air out of the mold and will cause burning. Generally, a vent should be as large as possible without allowing the plastic to escape. If the vent is too shallow, the clamping pressure could force it closed. If the vent is too large, plastic could escape and cause flashing. Vents are different sizes based off of what material is being used. Vents should be at the end of flow paths or where flow paths combine. Vents need to be cleaned in order to make sure it does not get clogged and the air can still escape.